Bell Travers Willson takes the digital design to construction. The Digital House utilizes the advantages of hi-tech production, such as, speed (five times faster than ordinary build programmes) and quality and the advantages of on site activities such as a flexible labour force with low overheads. 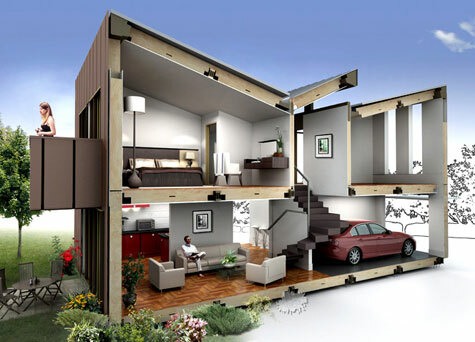 The Digital House is produced using a detailed 3D computer model that contains all of the construction elements including every wall and screw hole which are pre-determined before the construction. This information is transferred to a CNC Router (Computer Numerical Control) which rapidly cuts out elements in engineered timber. These are assembled into lightweight hollow cassettes like big bricks of Lego, which can be filled with recycled newspaper to achieve a high level of insulation and air tightness. The technology behind the Digital House allows every part cut to be different than the next, so that houses can be customized to each individual’s requirements. This moves away from standardisation that has previously been an economic driving force in prefabricated systems that are criticised for being inflexible in their designs and visually repetitive. The Digital House has been developed by FACIT the UK’s only architecture led building manufacturer producing digitally fabricated homes. Founded by London based architects and product designers Bell Travers Willson, FACIT provides a one stop shop for developers, self builders and other commissioning bodies delivering the complete building service from design, planning and digital production through to on site assembly.